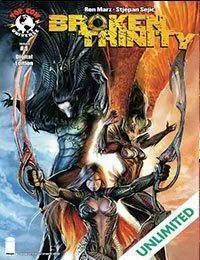 Broken Trinity brings together the Witchblade, The Darkness and Angelus once more, but this time the stakes are even higher as a new artifact is discovered, forever upsetting the balance of power. By the conclusion of the crossover, a major new player will be introduced into the Top Cow Universe, while at least one established character will be gone forever. The team of Marz and Sejic that dazzled you with First Born and their ongoing adventures on Witchblade is back to change the face of the Top Cow Universe one more time. Also featuring part one of a stunning triptych variant cover by Luke Ross (Indiana Jones, Green Lantern Corps).